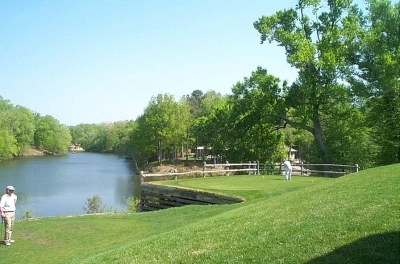 WILLIAMSBURG, VA -- The River Course at Kingsmill is one of a kind in Virginia. Sure, it�s got green grass like every other golf course -- with eighteen holes, tees, fairways, rough, bunkers, water and a nice clubhouse. But it�s not a stretch to claim the River Course stands apart from all the others. That�s because the River�s the only course in the state to host an annual LPGA tour stop � the Michelob Ultra Championship (in early May). It�s not to say that other notable Virginia courses don�t � or can�t � host professional touring events. 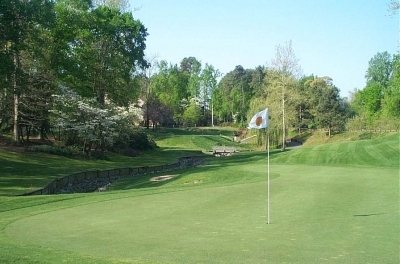 After all, the Robert Trent Jones Golf Club in Gainesville has hosted three President�s Cups, and several other great Virginia layouts have felt the soles of professional feet strolling their fairways as well. The River Course's par three 5th hole offers stunning visual beauty and a challenging golf hole. 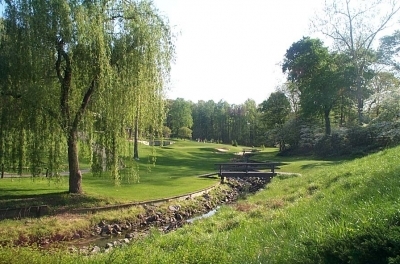 But the River Course is the only layout where lady pros will play every year � and the only course where a member of the public can come out and tee it up from the same boxes the �big gals� do. How about a little �match play,� pitting your scores against theirs? That�s a frightening thought. Playing the course certainly gives you an appreciation of professional golfing talents � and a depreciation of your own. No matter how depressing your score may be, you can�t help but have fun on this track. 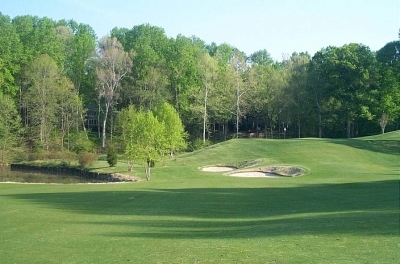 The River Course is a Pete Dye layout that takes ample advantage of everything the Kingsmill property has to offer � serene wooded glades, deep ravines, the banks of the James River and some serious historical significance to produce a magnificent and memorable golf course. It�s no wonder the men�s Tour came here for 22 years (the Michelob Championship, ending in October, 2002) � and it�s not just for the fresh beer provided by the Anheuser Busch folks. �The River Course also has the distinction of being one of a few golf courses that have hosted both a men�s and women�s regular Tour event. That just goes to show, it can challenge the best players in golf, men and women alike,� Hartig added. The par three 17th hole borders the James River. As if the view isn't distracting enough, the green looks tiny from the tee. It should be noted that the River Course will be closed in the near future (beginning in mid-May, 2004), for a pretty thorough renovation. The layout�s original features lasted a good twenty-nine years, but the folks in charge decided it was time for some changes. 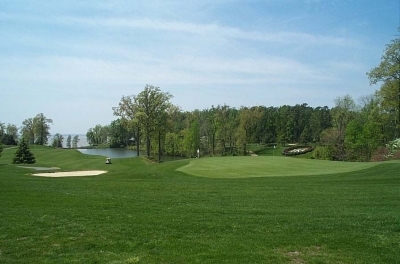 For that reason, Pete Dye and his group are coming back to Kingsmill to redo the River Course�s greens and bunkers. The changes will only bring more attention to one of the State�s best known golf layouts. Deservedly so. But it�s not fair to say the River Course receives the spotlight only because TV cameras show up once a year, or because there are frequent celebrity sightings on the grounds. For the other 51 weeks, the course dazzles members and resort guests with its incredible and thoughtful layout. Pete Dye is certainly known for creating tracks that challenge the best in the game, and the River Course does that � don�t let the 6853 (from the back tees) yard figure fool you. Length alone doesn�t this golf course make -- precise shot making is demanded from virtually every angle. 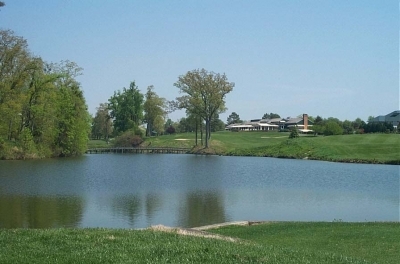 Kingsmill Resort's thoughtful layout is a large part of why the pros choose to play there. Gaydosh pointed to the unique placement of bunkers in front of potential pin placements, (or even in the middle of fairways) and correctly credited Dye with strategic foresight, forcing players to flirt with disaster in order to take strokes away from the course. It was like viewing an artist�s tableau in green organic forms. I definitely agree. The forward sets of tees won�t wipe away the challenge, either � just the amount of precision required from a particular shot. Too many great courses take away too many of the risks when considering tee box placement � not true the River course. The first two holes leading away from the main resort center are fairly wide open and make for a couple of good warm-up holes. Immediately you�re introduced to Dye�s use of scale to define targets � large sculpted bunkers framing landing areas, and large but severely undulating putting surfaces. They�re target holes without looking like �em. There's no getting around it -- you'd better put some serious air under the ball off the tee of the par four 18th hole, if you want to reach the green in regulation. The third hole begins a stretch of six holes that I�d say are the heart of the course, surpassed in difficulty and grandeur only by the closing three on the back nine. Three is the River�s number one handicap hole, and presents a dogleg left par five, 538 yards from the back tees. The second shot�s severely downhill, and unless you have sufficient distance and placement on your drive, may be blind. Going for it in two isn�t realistic for 99% of amateurs, as the green�s greatly elevated and protected by bunkers to the center left and a single sand trap right. Even the layup shot is tricky � the more you distance you try and cut off with your second shot, the closer water comes into play on the left, and the steeper the slope becomes to the green. Fantastic hole. Four requires a tee ball over a large ravine to a dogleg left fairway. Second shots face another elevated green protected by bunkers short, leaving a small area for runups to a short right pin position. Accuracy is a premium, again. The 538 yard, par five 3rd hole plays slightly downhill -- but if you're going at the green in two, you'd better be very accurate, since abundant trouble awaits for stray shots. Five is one of the most photographed holes, a downhill 183 yard par three. You�ll have to fly a rock-lined creek and place your tee ball onto a green protected by four bunkers � one for each corner. There is a large bailout area to the left, but that will leave a tricky side-hill lie from the rough from which to pitch on. Six and seven are also great holes, but in the interest of space, I�ll skip to number eight. It looked like quite a monster when I covered it during the Michelob Ultra, so I was very much looking forward to trying it out. �Only� 413 yards from the back, you�re called to fly a deep ravine off the tee to place your ball on top of a plateau. The challenge doesn�t end there � second shots are severely uphill to a long but narrow tiered green well protected by bunkers and rough. The green is harsh � a three putt actually looks desirable from some spots on it. After a return to the resort center for the ninth through 11th holes, you begin your outward journey once again. I�ve always been curious about thirteen from seeing it on TV � the tee box seems �suspended� over the lake that borders the right side of the tee area. Another elevated green lies across a small ravine from the tees. Fifteen is a fairly reachable 506 yard par five, but second shots must carry a large ravine to the front right of the green. Bailout left if need be. If the par three 13th hole's tee box feels like it hangs out over a ledge -- that's because it does. Sixteen begins the inward stretch and moves towards the James River in the distance. Don�t go right on your tee ball, or trees block your path to the green. Second shots must carry a railroad tie lined depression and bunkers to � guess what � an elevated, severely undulating green. A great hole to look at. 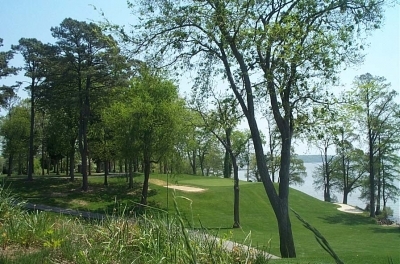 Seventeen is the only hole that actually borders the James River, and just off the coast is where the �Strange� navy used to lay at anchor during the tournament, looking on as players try to hit the green on this 177 yard par three. The putting surface looks miniscule from the back sets of tees � I just wonder how many balls are in the river! The seventeenth is also very historical � the site of a battery placement in the Revolutionary War as well as the Civil War (Confederate battery). In addition, it was the location of the wharf for the Kingsmill Plantation, and the starting point for a road that brought commerce to the Virginia Colonial Capital of Williamsburg. The Eighteenth is � what can I say � an incredible finishing hole. From the back tees you must launch a high tee shot to another plateau fairway, avoiding a lake on the left and trees to the right. Second shots carry a mowed ravine to an elevated green. No joke � the most severe putting surface I�ve ever seen � more bumps, plateaus and valleys than you�ll see in most national parks. What a way to finish. Whew! Looking back towards the 18th green -- this time, with no spectators, grandstands, or professional players. Just great golf. To sum up, the River Course is much more than what you see on TV, and much more than just a place where the LPGA calls home one week a year. It truly is one of a kind � in Virginia � or anywhere else, for that matter. Note: The hole descriptions were from prior to the May, 2004 renovation. The work is slated to take about 11 months, with the course opening just prior to the LPGA�s return in May of 2005. It should also be noted, though the LPGA event is just two years old, it has the third largest purse on the women�s Tour, and has been very well received by the players and fans alike.